A good pancake recipe is indispensable for anyone seeking domestic bliss and ours is worth a try. 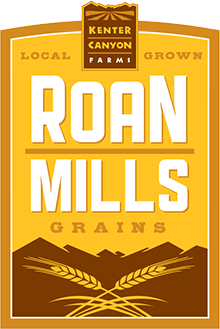 Our Roan Mills Sonora flour is particularly well suited to pancakes with its golden color and sweet wheat flavor. Served with maple syrup and fresh butter or yoghurt and fresh berries, breakfast feels like a celebration. The batter can be made ahead and stored in the fridge overnight or up to 1 day. Add a little milk to loosen it up as it will thicken upon standing. Combine dry ingredients in one bowl and mix well. In another bowl, whisk eggs together and stir in the remaining wet ingredients. Fold the dry ingredients into the wet ingredients. This batter should rest a few minutes while you preheat your cast iron griddle over medium high heat. Butter the surface of the hot griddle and pour about ¼ cup of batter onto the center of the griddle. Allow it to cook until the surface of the pancake shows pinholes and takes on a matte sheen, flip the pancake to cook the other side and remove to a towel-draped plate to keep warm as you work through the batter or serve hot as they come off the griddle, one at a time.